The Alamo Lake Park Store carries fishing and camping items like bait, lures, fishing licenses, boating supplies (boating flags, life jackets, boat cushions, ropes, anchors, battery clamps, etc. ), and firewood. We also have great park-specific Alamo Lake shirts, hats, patches, walking sticks, pins, books, and a wide vareity of other collectable souvenir items. We're there for you if you need a little something extra during your stay. Food items for sale include ice cream, soda, water, milk, eggs, canned vegetables, candy bars, condiments, hot dogs & buns, marshmallows & graham crackers, personal hygiene items, and more. Site reservations are available by calling the Reservation Center at 877-MYPARKS. You can call 7 days a week, from 8 a.m. to 5 p.m. MST. There is a $5 non-refundable reservation fee per site. You may also reserve campsites 24/7 for this park online. Campground A has 21 sites available while Campground B has 42 sites with mixed amenities. Sites 1-27 (electric/water) are $22 per night. Sites 28-42 (dry camp) are available for $15 per night. Dry camping is located in Campgrounds D & E for $15 a night per vehicle. Each site has a picnic table and fire ring. There are vault and chemical toilets located throughout the campgrounds. For cancellation policy, see Reservation Policies: Terms & Conditions. One group camping area has a 60' x 20' ramada with one barbeque grill for use. There is a vault toilet along with four chemical toilets located in the group use area. There is a $25 per day facility use fee for this area, and $15 per vehicle per night camping fee. This area can accommodate vehicles up to 60' long. For reservation, call the park at (928) 669–2088. There is also a second smaller group camping area. It has a 20' X 20' ramada, chemical toilets, fire pit and large group grill. There is a $15 facility use fee for this group area, and a $15 per night per vehicle camp fee. Rental cabins Fee: $65 per night. Pets must be declared upon reservation. There is a pet charge of $5.00 per cabin per day. Cabin occupancy: The rental party must comprise at least 1 person 18 years of age or older. Occupancy is a maximum of four adults not to exceed six persons total, including children. Site reservations are available by calling the Reservation Center at 1-877-MY PARKS (697-2757). You can call seven days a week, from 8 a.m. to 5 p.m. MST. There is a $5 non-refundable reservation fee per site. You may also reserve campsites 24/7 for this park online. There are 19 full hook-up sites with 50 amp electric, water and sewer located in the Main Campground. Each site has a picnic table and a fire ring. There is no limit to maximum RV length at these sites. Additional sites have 30/50 amp electric and water at each site. Campgound B has 27 electric sites. The Ramada Area has 12 electric sites. Cholla Campground area has 41 electric sites (30 amp). Each site has a picnic table and a fire ring. Effective Oct. 1, 2012, there will be a $15.00 per night fee for second vehicles. Fee will be paid upon arrival at the park. Fee does not apply to vehicles towed behind a primary vehicle when the primary vehicle remains at the site and the towed vehicle is used for transportation. There are two dump stations at the park. One is located at the Cholla campground, and the other is located in the main campground. Clean showers are located in camp areas A, C, and in the main campground. Regularly serviced restrooms are located in each campground, at the Visitor Center, and at each boat ramp. All restrooms are handicap accessible. The group day use areas have one 60 x 20 foot ramada with one barbeque grill for use. There is a $25 per day facility use fee for this area, and standard per vehicle day use fee. For reservation, call the park at (928) 669–2088. We have two group ramadas for day use. One south of Campground A and one in Campground E. The site in the group campground can be used for extremely large groups; contact the park for details. Group Rramadas are located in camp areas A and E.
Hikers and cyclists are encouraged to explore the park. Other Arizona state parks however offer a more extensive hiking trail experience. 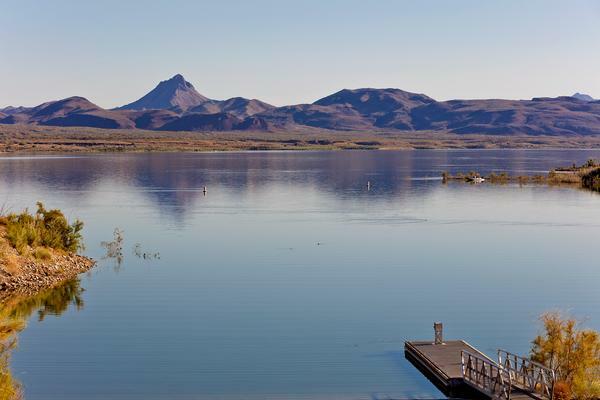 Alamo lake has largemouth bass, crappie, red eared sun fish, channel catfish, tilapia, and blue gill lurking in it's depths, although the lake is considered throughout the country as a premier bass and crappie fishery. Seasonally anglers can expect red hot fishing conditions, typically February through July. A valid Arizona fishing license is required for anglers 10 years and older. Licensing information is available online at Arizona Game & Fish, or purchase a fishing license from the Alamo Lake park store, or another local dealer. This park has swimming opportunities, but no beaches. No lifeguard on duty. Swimming is at your own risk. There are two paved boat ramps in the park. One is located in the Cholla campground and the other is located in the main campground. Non-motorized boats may launch at either boat ramp. The sonoran desert is alive with wildlife viewing opportunities. Although there is a variety of wildlife around the park, wild burros, coyote, eagles, pelicans, and Great Blue Herons are the most common. Birders enjoy the seasonally supplemented migratory bird species that visit the park each winter before the birds begin their northern journey when the desert temps begin to climb. Interpretive exhibits are located inside the park office. Camping is only permitted in designated sites. Maximum length of stay is 15 days. Fires are only allowed at campsites in designated fire rings. Littering is unlawful. Trash should be packed out and disposed of properly. All dogs must be kept on leashes. Please pick up after your pet. OHVs must be licensed and street legal. Limit of two vehicles per site. Leave something in your site to demonstrate occupancy at all times or site may be forfeited. No saving sites for people who are not in the park. First come, first served. Violators are subject to eviction. Vehicles arriving prior to 6 a.m. (Arizona Time) must pay for previous night.